Trombay is an eastern suburb in Mumbai, India. Trombay was called Neat's Tongue because of its shape. Once, it was an island nearly 5 km East of Mumbai and was about 8 km in length and 8 km in width. The island contains several ruins of Portuguese churches from the 1620s and 1630s. In 1928, the Great Indian Peninsular Railway opened the Trombay-Andheri line called the Salsette Trombay Railway or Central Salsette Tramway. 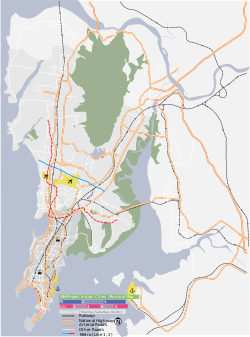 ^ Gazetteers of the Bombay Presidency - Thana - http://www.maharashtra.gov.in/pdf/gazeetter_reprint/Thane-III/places_Trombay.html - Retrieved on 3 December 2010. This page was last edited on 10 July 2018, at 01:27 (UTC).